Dave Gault (Sydney Australia) observed the star (2U 25370733) occulted by Pluto. He uploaded the video clip, which records this event as a movie with a chart of light curve obtained from the video, onto Youtube. And he kindly sent me an explanation about his observation and analysis and two graphs of the result. I am pleased to introduce his outstanding observation on my website as follows. The video recorded this event is below. The detail of this observation is described in Daves report on IOTA occultation message board as follows. I had two scopes and cameras running side by side. And he uploaded the video records the occultation by Pluto. I have uploaded the video to Youtube. jaw dropper seeing it live. 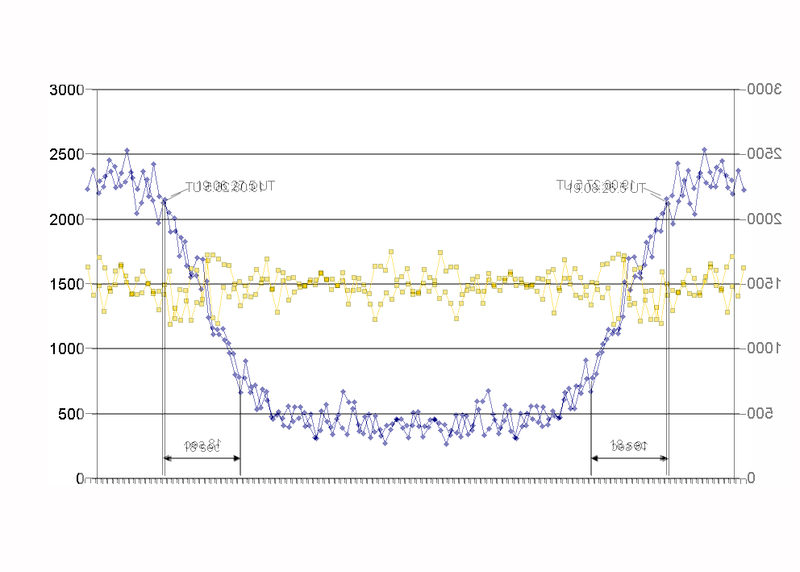 Below is a light curve the result of analyzing by Dave Gault. His explanation about how to obtain this data is below. Note: Several improvement to Dave's original description on his email were done by the author of this website to easily understand the relation between the chart and sentence. the latest version (Figure.1) were treated as I describe below. televisions, VCRs, PC TV cards and KIWI OSD will work correctly. In this case I set the camera to stack 32 frames. Linked Tracking option to more closely follow Pluto and the target star. frames and averaged each group. I then plotted it in the usual manner. readings due to varying sky conditions.